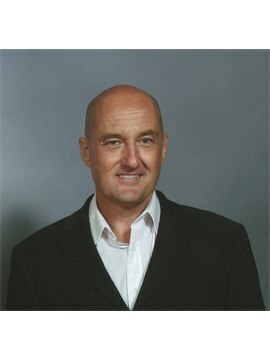 I have demonstrated Laptops, Desktop Computers, 4KTVs ,Power Tools, Lawnmowers , Digital Cameras, Printers, Mobile Phones, Games Consoles and Coffee Machines. I enjoy demonstrating and I am always punctual, reliable and polite. I enjoy surfing, swimming and Cycling. View my contact details, availability, and stats. I have been working as an In-store Demonstrator/Brand Ambassador for 18 years where I have gained lots of work experience demonstrating many different products. I am always punctual , reliable and polite. I have built up a good reputation in store and with different agencies. I have a good level of trust and respect. I love working with gadgets and demonstrating new technology. I am a qualified N.V.Q.Level 2 Gym and Fitness Instructor. Porsche New Range Exhibition - Porsche Stratford 2006. I have demonstrated , Computers, Laptops, 4KT.V. 's, Power Tools, Digital Cameras, Printers, Mobile Phones, Games Consoles, Computer Software/Hardware and Coffee Machines. 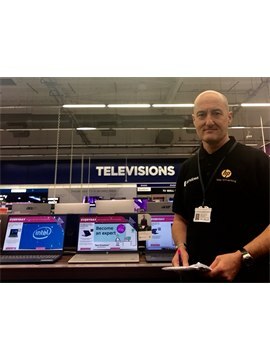 My last project was Panasonic 4K TVs in Currys , West Thurrock. I am currently working for Dell Laptops in Currys West Thurrock. Event Manager for Co op Re-launch Campaign 2008. I was responsible for organizing and overseeing a team of sampling and promotional staff in various Co op Stores in the South East for their store re-launch. Team Leader - Dell 2017 - 2018 I have also recently been a Team Leader on the Dell computing campaign. This required me me oversee a Team of 15 people around the South East. I am store approved in House of Frasier, John Lewis, Dixon’s/Carphone. Bosch Power Tools roadshow - 2004. Ford Fiesta Roadshow - 2006. Worx Powertools Roadshow - 2009. 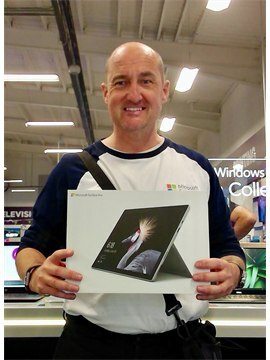 I have demonstrated Laptops, 4K TV. 's, Power Tools, Digital Cameras, Printers, Mobile Phones, Games Consoles, Computer Software and Hardware and Coffee Machines. I love technology and I am very happy to demonstrate anything technical. I have a current clean licence, I can also drive small vans. I have an OCR C.L.A.I.T. and an OCR E.C.D.L. (Computer Certificates) I have also worked with all the Major P.C. Companies Demonstrating P.C. 's , Software, Laptops and computer peripherals. I have an up to date CRB certificate. I have a First Aid Certificate. I have 8 O'Levels. 2 City and Guilds( Computer Technology and Graphical Communication) I have an OCR C.L.A.I.T. and an OCR E.C.D.L. (Computer Certificates) I am also an Intel Retail Edge Certified Specialist.